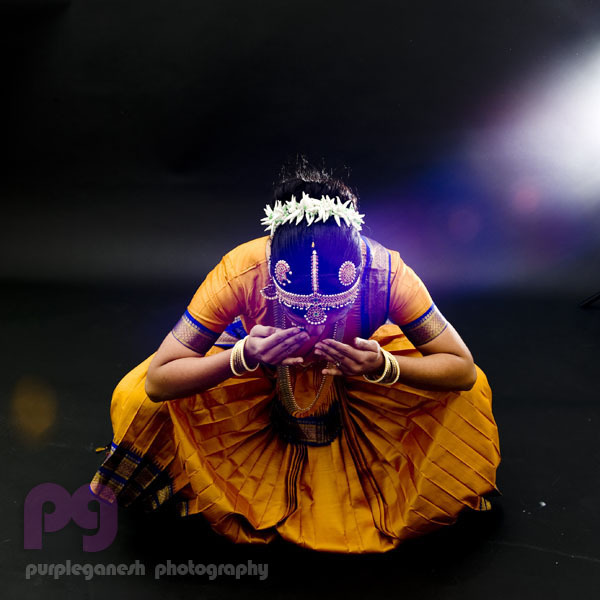 How can I break the pattern and have a Bharatanatyam portraiture session not turn into another series of canned poses? Not that there is anything wrong with photographing static frames - there is a whole lot one could do just with the lighting while focusing on sheer portraiture. Yet they still are "poses" - a contrived exaggeration of those fleeting moments in a standard repertoire - those that are entirely stripped of the energy and intensity that distinguish them in a good performance. No beads of perspirations reflecting the colored lights nor visibly palpitating torsos preparing the body for the next rush of rhythmic movements in space. 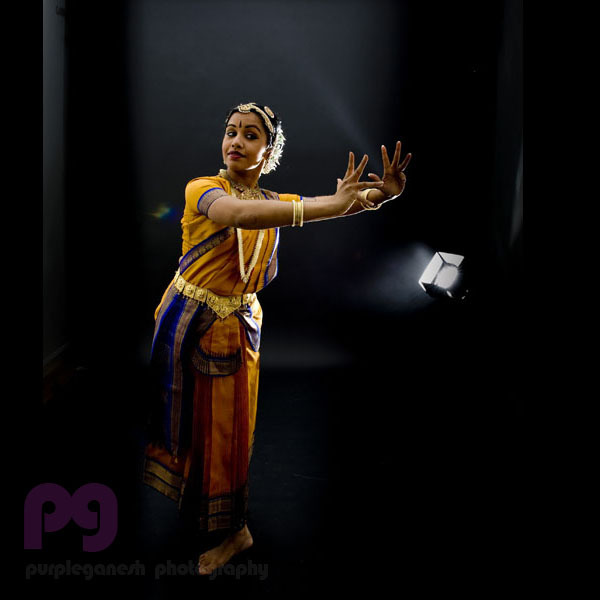 The following series of images were shot at my studio thanks to my muse, partner and artist-in-residence - Smitha Radhakrishan. This is a truly collaborative work where we started the photoshoot with a series of standard poses, and I began employing extended shutter speeds to trace the trajectory of these poses from point A to point B. 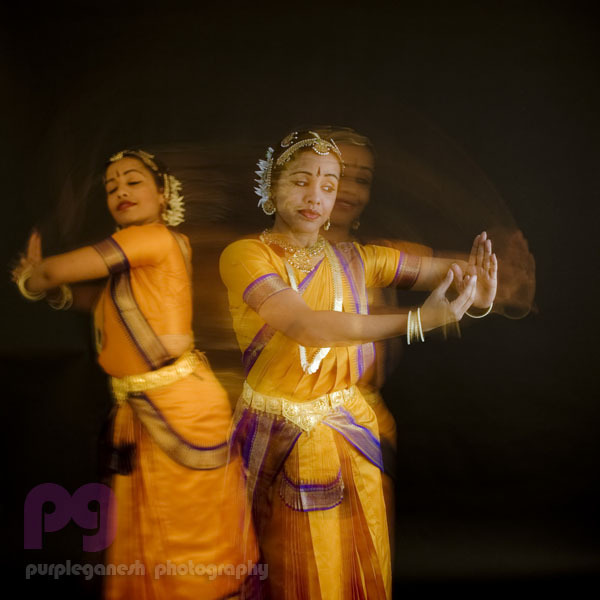 Eventually we proceeded to integrate "Abhinaya' - the emotive vocabularies - in the later shots.And I was pleasantly surprised to see that the camera was able to capture these emotions even when the body blurs in those few seconds. Based on the feedback from my 1.5"x2" camera LCD we went back and repeated the same steps till we got satisfactory results. There is really nothing new about integrating multiple frames in a single photographic frame. Eadweard Muybridge started doing this in mid 19th century. 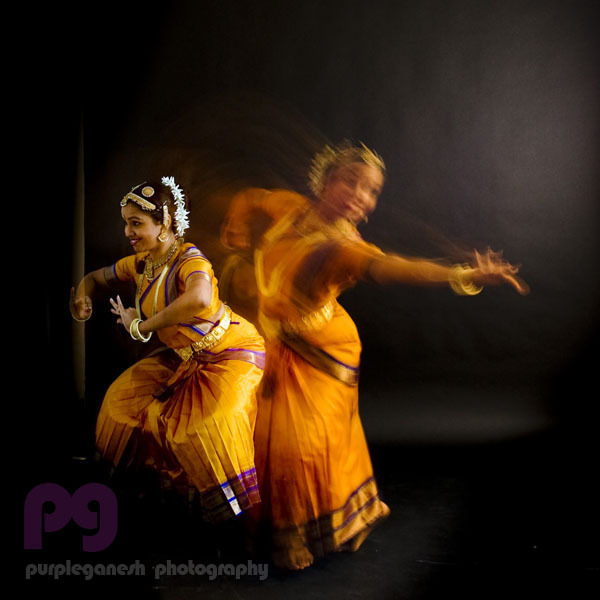 And these days its pretty easy to combine images and slap them with a "Motion Blur" filter in photoshop. However, if the point of the image is to make an artistic composition of a movement and emotional trajectory, I seriously doubt the usefulness of Photoshop. 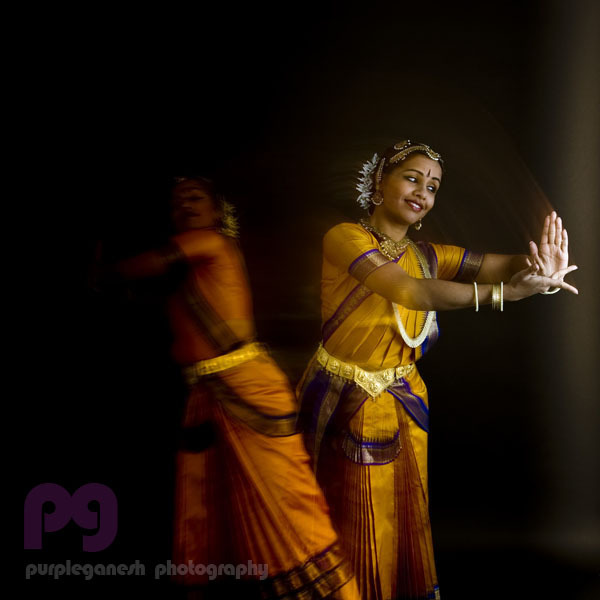 These are my first serious attempts in photographing movement vocabularies in Bharatanatyam in real time and I hope to do more of these sessions with accomplished artists in the next few years. Can I capture the stories narrated through space and time with a single shutter exposure....we'll see!! Shot with Nikon D700 and overhead halogen spot lights. No strobes.